During my long hours of doing nothing in Ethiopia, my kindle was my friend. And I finally got around to reading some classic SF. 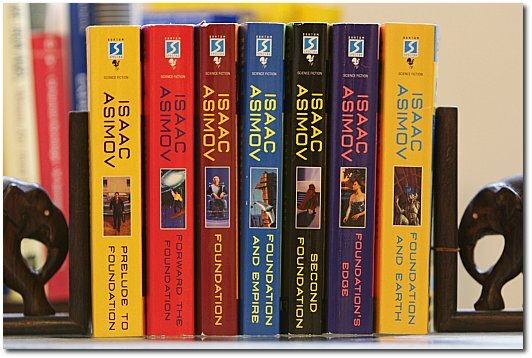 Terminus is a planet from Isaac Asimov's Foundation series. The set up of the books is that through the study of psychohistory, that is the made-up science of the behavior of large populations, it has been discovered that the empire is going to fall. There's no helping it, but there is helping the 'dark ages' to follow. It can be reduced to 1000 years. Of course, the Empire starts going downhill before it can be finished, but it does quickly place Terminus in a position of power due to it's knowledge and the technology it created. Book planets don't have images apparently, so here's the series on a shelf. Though it's worth noting that this is chronological order and not published order. I think I'd be slightly worried if I was going to a planet called Terminus! What a premise! psychohistory? some writers can be so clever it hurts :P now why didn't I think of that?